Well, we’ve teased about it on Twitter and today we’re launching a new competition – Eggheads (with sideburns): The Ultimate Derek Quiz – giving Derek fans the chance to win one of ten limited edition Derek prints from Posteritty, all of which are signed by Derek’s writer, director and star actor, Ricky Gervais! The new design from Posteritty fantastically captures the essence of the character that has stolen the hearts of the nation so we’re giving you the chance to have something that money can’t buy – a signed copy. 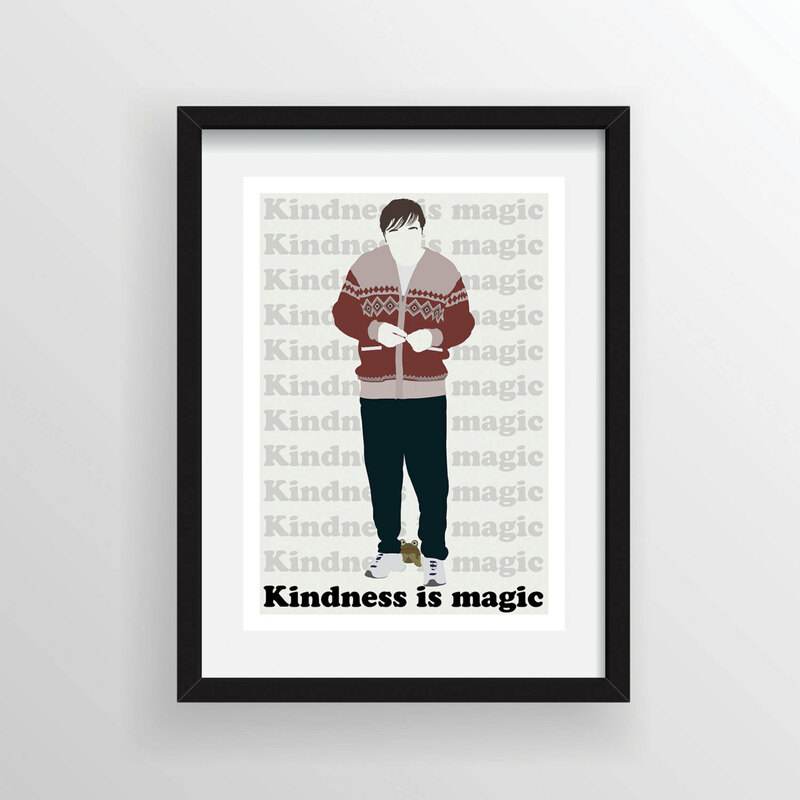 To see more fantastic minimalist art from Posteritty, visit http://www.etsy.com/shop/Posteritty and check out their entire collection of specialist Ricky Gervais prints. So how do you win? Well, Derek Series One has aired in the UK, not once, but twice, and is still available to watch on 4OD, so we think the fans should be able to answer some trivia questions to win these prizes. I could have written some questions myself, but I thought I’d ask somebody more informed. Thankfully he agreed so we have ten questions for you to answer written by Ricky Gervais. Ricky also kindly agreed to design (hand-craft) the “Eggheads (with sideburns)” logo. He put so much effort into it, I think you should all tweet him some kind words for his efforts! The closing date for the competition is Sunday, August 4th at 22:00. Winners will be picked at random after the closing date and will be sent a direct message on Twitter so make sure you follow @DerekTVShow. 1. What is the name of Derek’s favourite dog? 2. What solar powered animal needs fixing? 3. What does Vicky mainly read? 4. What is Pork Pie’s signature worth? 5. Why did Marge’s husband sell his car? 6. What was the name of the crab that scuttled off? 7. Who produces a beaker load a week? 9. What’s the name of Lizzie’s husband? What’s the only shortcut that works? So that's it. I know some of you are thinking you could easily copy and paste another tweeter's answers, but if someone gets a question wrong, you'll all get it wrong so have a go and enjoy! Terms and conditions: Only one entry per person is allowed. There are no alternative prizes. 10 winners will be selected at random from the correct entries after the closing date. The closing date for entries is Sunday, August 4th at 22:00 (GMT). Any entries received after this time will not be included.